It is clear from the Domesday survey that the twin settlements of Appleby Magna and Appleby Parva were well established before the Norman Conquest of 1066. The influence of the Danish incursion in the 9th century is shown in the Appleby place-name, with the Danish ending 'by' (village) added to the Old English element 'æppel' (apple). This implies that the major settlement, Appleby Magna, had come into existence before the Danes arrived, perhaps in the mid-Saxon period. The means by which the territorial extent of the village, ie the parish, came to be set out will be discussed in this chapter. The period following the Roman withdrawal has often been called the Dark Ages, not only because of the abandonment of the civilisation which the Romans had brought, but also because of the scarcity of surviving historical evidence. Historians have to take information from rare surviving documents and charters and piece them together with the results of modern research, usually in a local context, from different historical disciplines - for example archaeology, topography and the study of place names. When the Roman occupation came to an end in the 5th century, following the abandonment of Britain by the collapsing Roman empire around AD 410, the military and administrative props of society were removed (1). Many of the ‘Romans’ who were already settled on farms in the countryside (and who incidentally were not necessarily from Rome but came from anywhere in the Roman empire) stayed behind and lived alongside the British as did many soldiers discharged from the Roman army. With the withdrawal of Roman government, the remaining inhabitants were left to fend for themselves. Towns crumbled and Britain reverted to a more primitive society, lacking the order and control which Rome had brought. Even during the Roman occupation, Britain had been vulnerable to attacks from invaders from northern Europe. While the Roman army was in place, these invasions were repulsed or contained at the Roman frontiers (Hadrian’s Wall is the famous military line of defence in the north), but following the Roman withdrawal the population was left without adequate protection and invasions of fierce ‘barbarians’ from north Germany became an annual occurrence. The terrified British population, unable to resist the attacks of these Anglo-Saxon warriors, eventually bought off the invaders with land for settlement. By the middle of the fifth century the newcomers had settled throughout the whole country and, with the arrival of chieftains, the country became divided into small warring kingdoms. In this part of the east Midlands it was the Anglian people who settled, infiltrating the major river valleys as far as the Trent during the fifth century (2). By the sixth century, the kingdom in the border region along the Trent valley had become known as Mercia. The people were the Mierce, or Mercian, literally the people of the borders. Peter Foss suggests that the new settlers in the Trent valley moved cautiously up the tributary Tame and Anker valleys into the Mease and Sence valleys which were occupied by surviving Romano-British groups (3). The early, pre-Mercian, Anglo-Saxon place-name ending 'ham' (homestead or village) survives locally in the name of Measham, only two miles NE along the Roman 'travel corridor' from the Romano-British farm at Appleby (see Chapter 2). Foss thinks the proximity of an early Anglo-Saxon settlement close to the site of a Romano-British farm is not accidental. Measham may originate as the local survival of a farm or homestead from the period after the Romans withdrew. Recent archaeological evidence of farming activity of the early Anglo-Saxons overlapping with that of the late Romans comes from the Appleby Romano-British farmstead site. The summary report on the Appleby excavations states: 'Although all the finds were of late Roman date the site also showed possible evidence of Anglo-Saxon influence in the form of two ‘sunken featured buildings’. These buildings, with their distinctive sunken floors, were used as workshops or for storage and are common on Saxon settlements of 5th and 6th century date. The Appleby Magna examples may show that these were first being used in the very late Roman period or perhaps that Anglo Saxon settlers, bringing their own style of building, were amongst the inhabitants of the settlement still using essentially Roman styles of pottery.' (4) This early Anglo-Saxon habitation appears to have been a precursor of the later permanent village settlement half a mile away. Remarkably, during the early Anglo-Saxon period, Christian missionaries achieved the conversion of the Anglo-Saxons. The Church had already established a considerable presence during the Roman period and continued to thrive among the Romano-British population after the Roman withdrawal, although there appears to have been no attempt to convert the Anglo-Saxon settlers. The Celtic Church was established in Ireland in the fifth century by St Patrick, a Roman Briton who arrived there in AD 432. During the next century the Celtic Church sent missionaries into the north of England, led by St Columba, and they spread their influence southwards. This was followed, from the south, by the mission of St Augustine sent from Rome by Pope Gregory in AD 597. By the mid-Saxon period, the small Anglo-Saxons kingdoms had been re-organised by sub-division into so-called 'multiple estates'. The origin and significance of these is clouded in obscurity, but they may in some cases equate to divisions of the tribal regions of Romano-British times, if not earlier (5). By the twelfth century, the multiple estates themselves were divided into what we can recognise as administrative parishes, containing one or more settlements. 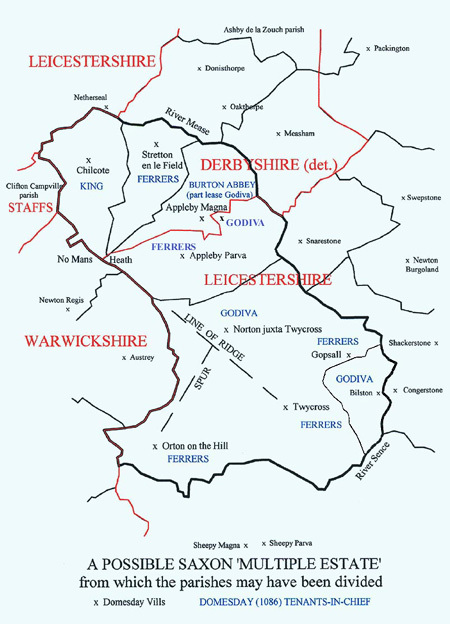 The existence of multiple estates is known from Anglo-Saxon charters where they survive, but in Leicestershire generally they do not. However, the evidence of Domesday Book and consideration of other factors such as land unit boundaries (parish, hundred and county) and topography have enabled plausible attempts at reconstruction to be made where there are no surviving charters describing the territory. The nearest local example is that of Market Bosworth attempted by Peter Foss (6). One of the clues to identifying these estates may be the distribution of churches and priests. Just as the later parishes were served by the Church with priests and places of worship, identification of churches and priests before the parochial system was fully established may point to the multiple estates which they served (7). Appleby is mentioned three times in the Domesday Book of 1086 with land held by Burton Abbey (Derbyshire) and Henry de Ferrers and Countess Godiva (Leicestershire) (8). The latter - the famous Lady Godiva of Coventry - was widow of Earl Leofric of Mercia who died in 1057. Burton Abbey had acquired land at Appleby Magna in the will of Wulfric Spot dated 1004 (9). The place name Appleby is a combination of Saxon and Danish elements which may well be a modification of a wholly Saxon name such as Appleton (10). As noted above, the settlement therefore appears to date from the Saxon period before the Danish invasions of the ninth century. Another recent suggestion, by Christopher Rigg, is that the name Appleby derives from the older British element 'apa' (water or stream). As the village developed in a shallow valley astride the village brook, this is indeed plausible. He deduces that 'the various Applebies were British villages until the Scandinavians arrived. All three Applebies in England grew up around streams and are not all in places for apple orchards' (11). If Appleby were indeed a British village, its origin would of course be before the Saxon period. To begin to sort out the origins of Appleby parish, as distinct from the settlement, we need to see how its geographical extent fits in with its neighbours. This may give us an idea of the position and size of the multiple estate from which the parish may have been sub-divided. Saxon churches are few and far between, being limited in this area to churches (with seventh century foundations) at Breedon and Repton, the latter being the burial place of some of the Mercian kings. But we can also look at the distribution of priests and the eleventh century Domesday Book is the earliest source that we have. Assuming that Domesday Book lists all the existing priests in west Leicestershire (and that is a big assumption), these were located at Ashby, Packington, Swepstone, Norton juxta Twycross, Market Bosworth (two) and Cadeby. There was none mentioned at Appleby, so it may be that the priest at Norton catered for neighbouring parishes including Appleby. Looking at the map, clearly the parishes of Chilcote, Stretton and Appleby were carved out of one unit of land. Their common boundaries, as I have noted before, radiate from No Mans Heath. The old county boundary line between Leicestershire and the detached part of Derbyshire, also radiates from the same point, separating Burton Abbey's land (Derbyshire) from the rest of Appleby parish from medieval times. To the south east, this group of parishes also joins smoothly on to the parish of Twycross, encompassing settlements at Norton juxta Twycross, Gopsall, Twycross and Orton on the Hill. To this latter group should be added the parish of Bilstone which also fits neatly into the proposed multiple estate. The Twycross parish grouping was made in 1935 from the ancient parishes now included within it. At the same time Bilstone, which had been an independent Civil Parish from 1881, was transferred to Shackerstone, where it now remains. However, before 1881, Bilstone was a ‘Township of Norton juxta Twycross Ancient Parish’. In other words, it belonged with Norton parish from ancient times, thus confirming its place within the multiple estate (12). No other contiguous parish joins smoothly to this larger group, the conjectured 'multiple estate', which appears complete in itself. Each internal boundary meets the peripheral boundary in a ‘T’ junction, a feature which Jill Bourne has pointed out is ‘a characteristic indicator of being arbitrarily drawn’ (13). This group therefore satisfies the test for a multiple estate. In terms of topography, this supposed estate stretched from the low lying lands bordering the River Mease in the north and the River Sence in the south-east and reaching up to the ridge running from No Mans Heath to Twycross, with its southern spur to Orton on the Hill. This landscape would have provided all the meadow, pastoral and arable lowland and heath upland required in farming, together with a good supply of water from the rivers and streams. The creation of the later parishes retained this upland/lowland duality with each territory stretching from the high heathland down to the rivers. It is not surprising that the ownership of land at the time of Domesday yields little information about the holdings of land as they existed several hundred years earlier. Estate boundaries must have changed and new groupings of land accumulated. We know that Wulfric Spot had accumulated an estate of scattered lands before his endowment of Burton Abbey in 1004. The Norman Conquest brought about the formation of large estates for the supporters of King William. According to the Domesday survey Henry de Ferrers, one of these tenants-in-chief, acquired a very large proportion of the vills (manorial territories) in this area including Stretton, Appleby Parva, Gopsall, Twycross and Orton on the Hill. The King himself held Chilcote (and Measham), as part of his Derbyshire estate at Repton. This may hark back to the Mercian system of collecting tribute and dues for the royal estate (14). However, there is a suggestion of an earlier territorial grouping across our supposed multiple estate, in that, at Domesday, the Countess Godiva held Norton juxta Twycross and half of the arable land of Appleby Magna. It is notable that the Abbot of Burton, who held the other half of the parish, was under the patronage of her husband Leofric, the Earl of Mercia (15). Godiva's only other holding in Leicestershire was at Bilstone, also within the proposed multiple estate. Most of the remainder of the estate territory was acquired by Henry de Ferrers at the Conquest (see map). This leads to the suggestion that before the conquest, the whole of this territory had belonged to either Godiva herself or to her husband Leofric, the Earl of Mercia. As we have seen, the only priest mentioned in Domesday Book for the area covered by these parishes was at Norton juxta Twycross and this location would have been conveniently central for serving the whole supposed estate. It would be fitting for the priest to have been provided by the pious Countess, who with Earl Leofric, founded and supported religious houses such as St Mary’s Benedictine Monastery and Abbey in Coventry (16). All of the factors discussed above combine to suggest that we have identified the Saxon estate from which Appleby Magna, with Appleby Parva, and the neighbouring parishes of Chilcote, Stretton, Norton, Orton, Twycross, Gopsall and Bilstone were derived. The association of several remnants of the estate with the Countess Godiva points to the likelihood that it had originated as one of the territories of the House of Mercia. 8. Domesday Book,1086, Folios 230- 237, Leicestershire and Folios 272 - 278, Derbyshire. 9. Will of Wulfric Spot, 1004 - 'originally in the archives of Burton Abbey and passed to Sir William Paget who acquired the abbey estates at the dissolution of the monasteries. His descendant the marquess of Anglesey, deposited them in Burton Museum but they are now in the Staffordshire Record Office.' Denis Stuart, Illustrated History of Burton upon Trent 1993. 11. Christopher Rigg, 'Nailstone revisited', LAHS Newsletter 81, Spring 2010, p.12; Rigg also notes the tendency of Old English dialects to insert a 'dark' L or R after an open vowel; so 'apa' would have been pronounced 'apl-' and 'by' would have been 'byr'. It is of note that the Domesday name for Appleby Parva, 'Apleberie', contains both of the 'dark' letters, L and R, whereas the two Domesday versions of Appleby Magna, 'Aplebi' and 'Apleby', contain only the 'dark' L .
12. Victoria County History of Leicestershire, Vol III, 1955, pp180-201 ‘Population Tables’: p 183 Bilstone, p 194 Norton juxta Twycross and p 201 Twycross, footnote (j). 15. At Domesday (1086), five carucates of land at Appleby Magna were held by the Abbot of Burton, one of which he leased to Godiva who already held three, so they each farmed half of the parish - see 8. The past tense ‘held’, used in the survey, signifies that her land had been confiscated by the King; Godiva died in 1067.